Can you really survive without a car? When we moved to Melbourne, we stopped using our cars. We sold our Xtrail and cleared some debt. Our other car was slightly damaged from 2 car accidents which we were not at fault for. Had the damage been done in one car accident the insurance company would have written it off (panel damage/scratches only on pearlescent paint), but as it was 2 accidents, 2 different companies I could either get it fixed or get paid out. I got paid out as the car was clear to drive and mechanically sound plus the damage isn’t too bad. But it means it isn’t really easy to sell so it has sat at a friends house and we have used it a handful of times in the past year for long trips to Bathurst, Canberra or Sydney, which could have been done without the car. Living in Canberra, a car was pretty much a necessity. We lived too far from everything, the public transport was atrocious and it would have been 2 buses and 1 hour to get my kids to school, the same to get home vs 10mins driving in the car. Not practical at all. This post contains affiliate links for products/services I use. Read my full disclosure here. 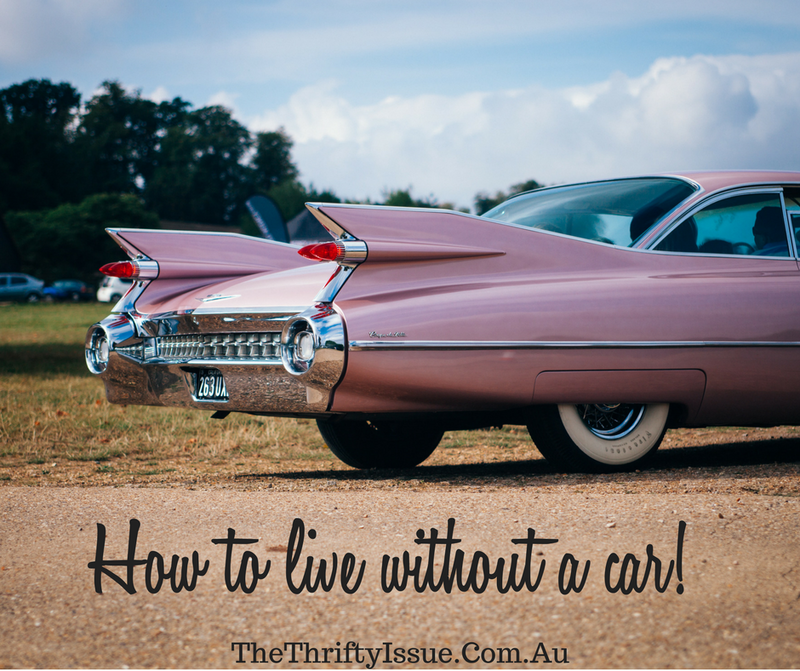 How can you live without a car? We live pretty close to everything here in Melbourne. When we first moved we would only walk if somewhere was under 1km away. Now walking 3kms to something isn’t uncommon. We listen to podcasts, chat or combine free trams with walking etc. Public transport is so easy here. If you can, choose a location which enables you to walk, ride a bicycle or use cheap public transport instead of owning a car. The cost of the occasional public transport or Uber for us is significantly cheaper than the car. Melbourne has trams, buses, trains, Uber (I refuse to use a taxi! ), bike paths and it is incredibly easy to get around. As with all cities, peak hour can be hectic, but for the most part, it’s ok. Often, public transport here would take the same amount of time as driving but on public transport, we can work, listen to podcasts or do our own thing plus it’s cheaper. Whenever I have needed a car I have either hired one such as through Car Next Door (as little as $5an hour or $25 a day) or used a ride option. Uber, Ola, Taxify and Shebah are all available in my area. If you use the code kyliet591ue you can get your first Uber ride free (up to a limit). Ola gives you $20 off with the code AGNZEEU and Taxify offers $5 off with the code QQMPG. Ola and Taxify regularly have discounts too whereas lately Uber has always been surging so I haven’t used it. Alternatively, if you want to keep your car, you get free insurance plus payment for when people drive it if you want to rent it out through Car Next Door. Think you need a car to do groceries and errands? Think again. Jump online and get it all delivered. It usually takes you less time, you can save your shopping lists with some supermarkets, delivery is often free or there are special offers if you spend over a certain amount. Plus, if you use sites like CashRewards, PricePal or Honey, you’ll get an automatic notification of cash back options, discounts and other offers, saving you even more, money. We are so dependent on cars. It is often seen as a status symbol to have a certain type of car or a new car, but cars depreciate in value so quickly and cost so much to run. The purchase price, interest on the loan, petrol, services, tyres, cleaning, registration and insurance all add up. I worked out last year if we kept the cars, based on previous habits, it would have been around $20k a year total our 2 cars were costing us. TWENTY THOUSAND DOLLARS! A car is not essential (for many cities, not all)! While we tend to view them as necessary for everyday life, if you break it down, it might horrify you. Purchase price $2,000 per year (based on a $20,000 car kept for 10 years and spread over that time. However, if you get a loan to pay for this, at 10% it will cost you $31,700 for the 10 years or $3,170 per year). Don’t forget you also need to factor in savings for a new car. Want another $20,000 car in 10 years? You might get $5,000 for your current one if you’re lucky. So you will need $15,000 over 10 years or $1500 a year to be able to pay cash for your next car instead of a loan. All up, including saving for your next car, it is over $10,000 per year. Sit down and work out how much your car is costing you and if it is cheaper and possible to walk, do public transport and occasionally Uber if needed. What do you think, can you live without a car? Neighbourhood car share is also a cheap and easy way to get access to a car when you need to drive somewhere or want to get away for the weekend – try http://www.carnextdoor.com.au. There are over 1,000 cars rented out by local people in Sydney, Melbourne and Brisbane. Great tip, Kate. I forgot to add that in. Thanks so much! Have you used them?